You're in for a delight travelling BA. The bar (wine, beer, and spirits) is free, and open all the time. 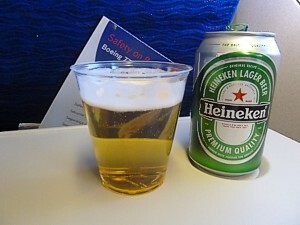 If you ever feel thirsty, you can get a drink pretty much at any point until landing - in Club (business) you can even drink while landing - the crew will happily exchange your glass for a plastic one. If you ever miss the drinks trolley, you can nip up to the galley and ask. If you are flying in Club World (Business Class) don't miss out on the well-stocked 'Club Kitchen' to raid. There are cartons of Tesco-style juice, and bottles of water. There is normally no beer, but there are two bottles of wine, a white and a red: however, if you want a better choice there is nothing to stop you from asking the crew for anything on the wine list. All wine in Euro Traveller, World Traveller (economy) and Club Europe (business) comes in 187ml bottles, so you can take the stuff off the plane. Indeed on real short haul routes I have know the staff to stand by the doors handing out bottles as you get off. These will be opened for you unless you ask. From the historic wine region of Carinena. Bodegas San Valero was born as a wine cooperative in 1945, gathering 60 grape growers. Today it has over 700 active members who own about 4,000 hectares of vineyard. Prefermentation maceration for 3 hours followed by modern winemaking techniques and cool fermentation in stainless steel vats to enhance soft fruit flavours & preserve freshness. A fruit driven white with plenty of fresh fruit flavours of vibrant peach and apple lifted by the acidity on the finish. The Laboure-Roi winemaking facility in Nuits-Saint-Georges is indisputably one of the finest in Burgundy. Armand Cottin acquired Laboure-Roi in 1974. From its start in 1832, the small yet very prestigious Burgundy negociant house (established in Nuits-Saint-Georges by Mr Laboure and Roi) had been firmly rooted in the local winemaking community, enjoying an excellent reputation for its high quality wines. 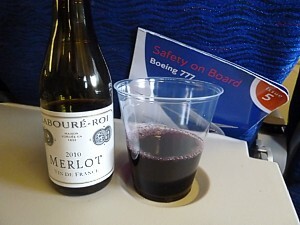 It's good to see this 100% Merlot in economy on British Airways. With a deep ruby red colour with violet tints, it tastes of ripe fruit, having a soft delicate flavour, and a smooth finish, thanks to the grape bunches which are de-stemmed and cold macerated to maximise the colour extract. The wine is aged in tank for 4-6 months before bottling, and then stored for a couple of years by BA before being put onto your flight. I love this - this is perhaps not the best Sauvignon Blanc, but I like it's hash and sour bitter taste. It need to be very well chilled, which BA often manage. BA carried a lot of stocks of this in 2001 and 2002. It then disappeared from view, until 2008 when it became the common wine for economy. The 2003 Bordeaux Sauvignon is pressed slowly and vinified at carefully controlled temperatures which insures plenty of varietal extraction. Crisp and lively, with grapefruit, mango and peach notes, it is perfect as an apéritif, with seafood and fish, chicken dishes, or just to sip on its own. It comes from the vineyards of the Despagne family have owned and grown vines on the 49 acre Mirambeau site for over 250 years. Hardy's Nottage Hill Riesling is a delightfully subtle white from South Australia, which slips down nicely. It goes with anything, and nicely chilled makes the miles slip by. Foul stuff, this French jet fuel, is old, tired, and fit for only one thing. Return the bottle if you see any of the Chateau Rauzan Despagne bordeaux Savignon. 12%. I love this, and other people hate it, but Chapel Down is virtually impossible to get in the UK - BA have taken most of the supply, and ship it out merseylessly. Very sweet, its not to most peoples taste. It has one big problem - the caps are virtually impossible to get off, so always ask the crew to get it off with you. I once saw a 737 full of passengers struggling. Its worth taking it only for the novelty value. 10.5%. South Australian, and you know what you're going to get. Just like the stuff you can get in Sainsburys Jacob's Creek is pretty good. No suprises here, but it goes (oddly) very well with BA's cooked breakfasts. Mainly served on the Australian routes. 11%. 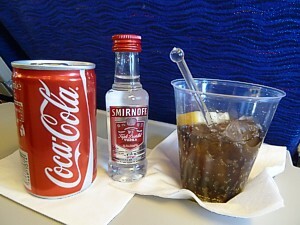 This is served on mostly European short-haul routes, and is now becoming pretty common on many flights. Its also on medium-haul to the middle east. Bland and inoffensive, its got a full bodied chunky taste, and works well with red meat. 12%. A tough one to describe, because this, one of the mainstay of Hardy's stable, is rich in fruit flavours and yet ends with a neat soft finish. It goes particularly well with beef or lamb dishes, when BA serve them. Mainly served on the Australian routes. 13.5%. The new Sparkling Wine for ClubEurope. BA have finally axed the MonoPoo in Club Europe, and now offer this somewhat better alternative. Fine sustained bubbles. Classic excellent nose of peach, citrus, pear mingled with apricot and a biscuity vanilla edge from its lees aging. Elegant yet complex. The old Sparkling Wine for ClubEurope. This is no longer available in Club Europe except for some outstations. Piper-Heidsieck Monopole Bluetop Sparkling Wine is still a good Sparkling Wine, but not as good as the true mix above. Still, if you've paid several hundred quid for your ticket, you might as well enjoy more of this stuff from Reimes. The Piper-Heidsieck Monopole is also available in economy, if you pay for it. Occasionally you can find this Sparkling Wine in economy longhaul. South Australian Carrington Vintage Brut is a nice, delightful, sparkling white, which only goes well on its own. No longer available - Sparkling Wine in Club. In Club Europe you used to get the Piper-Heidsieck Sparkling Wine Brut. A really good Sparkling Wine, its pricey on the ground... so you might as well get the benefits of paying a fortune for your ticket, and enjoy this proper French stuff from Reimes. 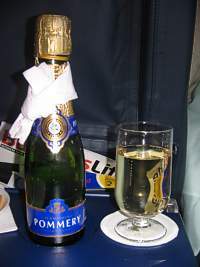 The Piper-Heidsieck is also available in economy, if you pay for it. It's all of £4, but can make a WT trip feel better. On the longest Club Europe flights (band 4 only) Port is available. Dow's Midnight has a good dark hue, but only moderate intensity. There is a waft of spirit on the nose, which blows off to leave figgy-chocolate notes. It has a decent texture, which holds well through to the finish. Some black fruits with a creamy note if held on the palate, but not an overtly rich wine. Soft, integrated low level of tannins. Throughout the palate there is a somewhat harsh acidity. Short length. Some bad points here, but it is drinkable. 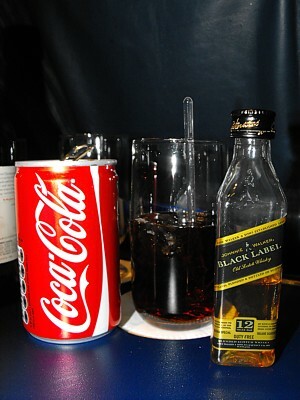 A standard Johnnie Walker, mixed with equally standed coke. The whisky on board is the pretty dull and manufactured version made by Diageo at Leven in Fife, it is the most widely distributed brand of blended Scotch whisky in the world. Considering some of the delightful whiskys produced in Scotland (NB: only foreigners will call it Scotch) it is really quite dull. Black label is a blend of about 40 whiskies, each aged at least 12 years. Smirnoff Red Label vodka and coke. Plain, simple, normal, and as you'd get it in a pub in Croydon. Gordon's Gin, Schwepps tonic, lemon, ice and nibbles. AS for a G&T, with Ice and Slice, and you'll get the dull and rather cheap Gordon's Gin. Pretty standard London Dry gin made by Diageo, it is still the standard mother's ruin made by Alexander Gordon, in 1769, and unchanged to this day, witb triple-distilled juniper berries, coriander seeds, angelica root and one other botanical. Note that it is the UK version, at 37.5%, rather than the US at 40% or the European 47% monster. A bit of trivia for you: Tonic water contains quinine, which mosquitos don't like and so of course prevents malaria. In the 18th century it was handed out to troups in the colonies, to stop malaria, but it had a very bitter taste; hence, the navy started adding gin to make it more palatable. Tonic water on BA still contains quinine, and it still does pretty much the same job. 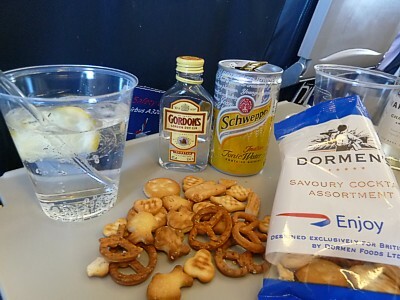 The nibbles themselves come fron Dormen's savour cocktail assortment. On the shorter flights in economy, it's all you're going to get. BA have recently revamped the beer selection - and now there's a good choice on board. Make sure you don't just ask for "beer" as you'll get whichever can is on top plonked infront of you. Ask to see the selection first. All the cans come in tins opened for you, so if you plan to take the stuff off, ask for two tins - one closed. Served weaker than in UK pubs (so passengers can walk when they get off the plane) its still a lovely smooth Belgium beer (even if it comes from Luton). In a 330ml can. 5.2%. 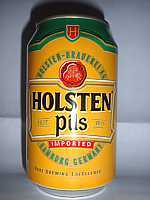 Served on flights to Germany, and some other German speaking parts of Europe, plus holiday flights to the med, there seems to be little reason to serve this - few people ask for it, and you'll blow dust off the can. It is however the real stuff from Hamburg. In a 330ml can. 5.5%. Served on flights to Scandinavia plus most transatlantic flights. I like this, it slips down smoothly and offers little in the way of lasting hangovers after stepping off the plane. In a 330ml can. 5%. A premium hoppy ale, this is one you either love or hate. Most foreign tourists turn their noses up at this, but it does have something of a cult following by many of BA's passengers. 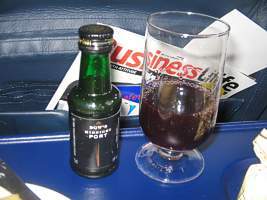 Fuller's brew is mainly served on the Atlantic and Australian routes. 4.7%. A wacky one, which takes some getting used to. Check out the tins served in the UK - they are always brewed and canned in California, and come complete with a US government health warning! So BA really do import coals - or rather beer - to Newcastle. 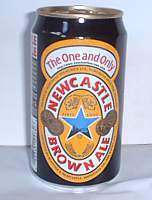 Newky is something of an institution up north, and is always served on the BA LHR to Newcastle route. 4%. 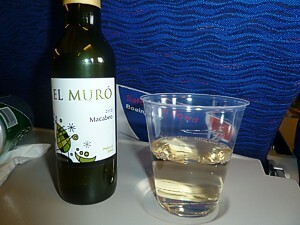 Served on flights to Ireland plus most long-haul flights. 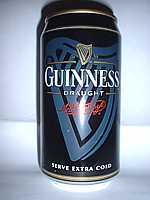 This is the real black stuff from St James' Gate Guinness brewery in Dublin, with a floating widget in the can to give a good creamy head. The problem is of course that on board there are only tiny glasses, so getting enough in to make a head is tricky. Take real care when opening - often its not been chilled, and has also been shaken on take-off, so will explode all over the cabin - indeed fun can be had watching passengers open theirs without thinking about it. In a 330ml tin (but bigger than others to allow for the widget). 4.2%. 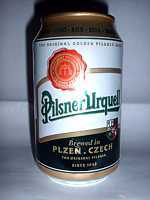 Served on flights to Prague and Munich only, the Pilsner is a rare treat. 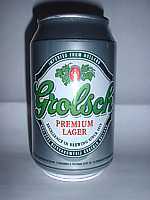 Brewed in the Czech republic its a very good light largery type beer. 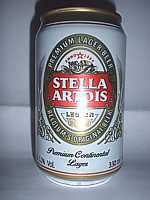 In a 330ml can, 4.4%.